used root-litter bags, and followed dry matter and nutrient loss over several months to a few years. Unfortunately, preparation of the root tissues for decomposition studies represents a significant departure from in situ conditions. Dornbush et al. (2002) developed an intact-core technique that retains natural rhizosphere associations, maintaining in situ decay conditions. Cores (15 cm long by 5.3 cm in diameter) were taken under monospecific stands of silver maple, maize, and winter wheat, and covered at the top and bottom with 160-micrometer mesh polyethylene caps. The same mesh was used to make litterbags to hold an amount of roots similar to that in the soil cores. After reinstallation in the field sites, cores and bags were retrieved seasonally at time intervals up to 1 year and the decay rates compared. After 1 year, mass loss was 10-23% greater and nitrogen release was 21-29% higher within intact cores than in litter bags (Fig. 5.18). Dornbush et al. (2002) attributed a majority of the differences to alterations in litterbag-induced dynamics of decomposer organisms and unavoidable changes to fine-root size-class composition (less than or equal to 1 mm in diameter) in the bags. FIGURE 5.18. (a) Mass loss, (b) nitrogen loss, and (c) changes in carbon-nitrogen ratio for fine roots of silver maple, maize, and winter wheat decomposed in a riparian meadow in central Iowa in the United States. Solid circles represent intact cores, and open circles represent litterbags (lb); k values are based on exponential decay models. In the upper six panels, the intact-core data are normalized such that 100% equals the t = 0 intercept of the exponential decay regression; error bars are +/-1 SE (from Dornbush et al., 2002). preferential flow paths than in the soil matrix. 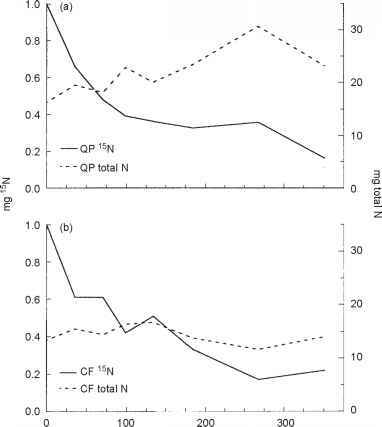 In addition, organic nitrogen concentrations, effective cation exchange capacity, and the base saturation were all increased in the preferential flow paths. 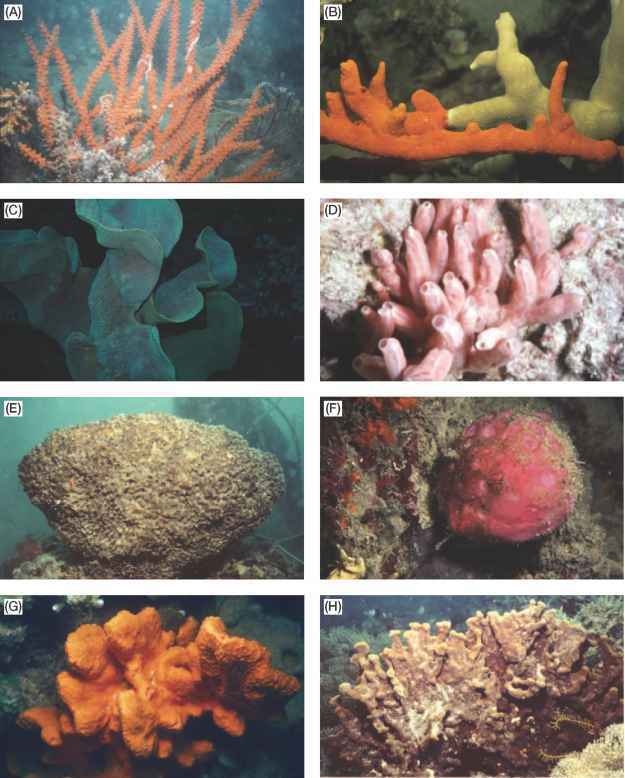 DNA concentrations and direct cell counts showed similar patterns, but there were no changes in domain-specific organisms such as Eukarya or Archaea. 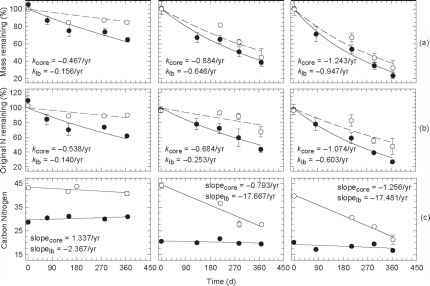 However, Pseudomonas showed increased abundances in the preferential flow paths, indicating that it responds to increased organic matter status in this "hot spot" similarly to that in other locations such as the rhizosphere (Bundt et al., 2001). Nutrients and organic matter also move through soils in soluble form, for example as dissolved organic matter (DOM). In general, sorptive interactions between DOM and mineral phases contribute to the preservation of soluble, or soil, organic matter (SOM). However, the situation is considerably more complex than this, due to the existence of several structural events in the soil profile. In a comparison of movement in the profiles of seven forest soils, Guggenberger and Kaiser (2003) considered the location of organic matter (OM) within the soil profile. They contrasted the amount and concentrations of OM in soil water with that on "fresh," or exposed, mineral surfaces versus that on "natural" soil surfaces that have a considerable amount of microbially derived biofilms. Based on their study, they produced a conceptual model of entities in the soil profile that differ in their biological activity. In the soil solution, soil microorganism density is low, OM concentration is low, and there is little biodegradation of DOM. On the "fresh" mineral surfaces, there is OM sorption to minerals, including complexation of functional groups, changed conformation, incalation in small pores, and sorptive stabilization. On the "natural" soil surfaces with high microorganism density, there is OM sorption into biofilms; the sorption concentrates OM, which appears to be a prerequisite for decomposition (Fig. 5.19) (Guggenberger and Kaiser, 2003). Research is currently underway to determine the dynamics of exchange phenomena between DOM and biofilms. The OM input enhances the heterotrophic activity in the biofilm, converting the DOM into either organic compounds by resynthesis or inorganic mineralization products. Iron hydrous oxides embedded within the biofilms may serve both as a sorbent and a shuttle for dissolved organic compounds from the surrounding aqueous media. FIGURE 5.19. Conceptual model of the fate of organic matter in the soil solution and sorbed to soil surfaces differing in their biological activity (from Guggenberger and Kaiser, 2003). new approaches are giving us better insights into soil ecosystem function, as noted in Chapters 3 and 8.